SMITHS FALLS, ON and ST. JOHN'S , Oct. 17, 2018 /CNW/ - Canopy Growth Corporation ("Canopy Growth" or the "Company") (WEED.TO) (CGC) is pleased to join Canadians and cannabis advocates from around the world in celebrating today's legalization of recreational cannabis in Canada . With the dawn of this new day, Canada becomes the first G7 nation to legalize and regulate recreational cannabis, and the first to do so while ushering in a diverse, professional retail marketplace for cannabis products. 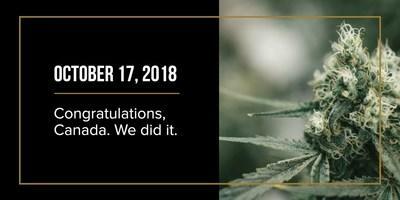 To celebrate the day, the Company's Founder and Co-CEO Bruce Linton completed (what the company believes was) the first legal sale of recreational cannabis in Canada at the Tweed flagship store on Water Street in St. John's, Newfoundland at 12:00 a.m. Newfoundland Time. "On a day like this, it's important to recognize all those who struggled, and fought to get us here. The advocates, patients, physicians, lawyers, and many more who can celebrate today as the product of years, if not a lifetime, of hard work. We couldn't be more excited to open this new, legal, regulated market for recreational cannabis in Canada and to now provide Canadians with a diverse supply of high quality, safe cannabis products," said Bruce Linton , Founder and Co-CEO, Canopy Growth. "Now the real fun begins. In addition to our constant focus on education, we can start introducing customers to the differentiated retail experience and high-quality products we're proud to offer. We look forward to continuing our introduction to Canadians and invite the curious in for a conversation. Our staff are experts and are ready to answer the questions people have never had the chance to ask in a legal marketplace before," said Mark Zekulin , President and Co-CEO, Canopy Growth. With all the excitement around legalization, it's also important to celebrate and enjoy responsibly and with that in mind, management has also issued the following statement in support of Tweed's ongoing Don't Drive High campaign in partnership with Uber and MADD Canada. "Don't drive high. Period. There are at least 101 better things to do instead. Need ideas or a $5 credit for an Uber where eligible? Check out DontDriveHigh.ca." We're fond of Future Growth but today, here's to October 17, 2018! Canopy Growth is a world-leading diversified cannabis and hemp company, offering distinct brands and curated cannabis varieties in dried, oil and Softgel capsule forms. From product and process innovation to market execution, Canopy Growth is driven by a passion for leadership and a commitment to building a world-class cannabis company one product, site and country at a time. The Company has operations in 12 countries across five continents. The Company is proudly dedicated to educating healthcare practitioners,conducting robust clinical research, and furthering the public's understanding of cannabis, and through its partly owned subsidiary, Canopy Health Innovations, has devoted millions of dollars toward cutting edge, commercializable research and IP development. Through partly owned subsidiary Canopy Rivers Corporation, the Company is providing resources and investment to new market entrants and building a portfolio of stable investments in the sector. From our historic public listing on the Toronto Stock Exchange and New York Stock Exchange to our continued international expansion, pride in advancing shareholder value through leadership is engrained in all we do at Canopy Growth. Canopy Growth has established partnerships with leading sector names including cannabis icon Snoop Dogg, breeding legends DNA Genetics and Green House seeds, and Fortune 500 alcohol leader Constellation Brands, to name but a few. Canopy Growth operates ten licensed cannabis production sites with over 4.3 million square feet of production capacity, including over 500,000 square feet of GMP certified production space. For more information visit www.canopygrowth.com. This news release contains "forward-looking statements" within the meaning of the United States Private Securities Litigation Reform Act of 1995 and "forward-looking information" within the meaning of applicable Canadian securities legislation. Often, but not always, forward-looking statements and information can be identified by the use of words such as "plans", "expects" or "does not expect", "is expected", "estimates", "intends", "anticipates" or "does not anticipate", or "believes", or variations of such words and phrases or state that certain actions, events or results "may", "could", "would", "might" or "will" be taken, occur or be achieved. Forward-looking statements or information involve known and unknown risks, uncertainties and other factors which may cause the actual results, performance or achievements of Canopy Growth or its subsidiaries to be materially different from any future results, performance or achievements expressed or implied by the forward-looking statements or information contained in this news release. Examples of such statements include statements with respect to "provide Canadians with diverse supply of high quality, safe cannabis products"; and "introducing Canadians to the differentiated retail experience and high-quality products we're proud to offer". Risks, uncertainties and other factors involved with forward-looking information could cause actual events, results, performance, prospects and opportunities to differ materially from those expressed or implied by such forward-looking information, including the availability and supply of cannabis products; the availability of staff for consultations; and such risks contained in the Company's annual information form dated June 28, 2017 and filed with Canadian securities regulators available on the Company's issuer profile on SEDAR at www.sedar.com. Although the Company believes that the assumptions and factors used in preparing the forward-looking information or forward-looking statements in this news release are reasonable, undue reliance should not be placed on such information and no assurance can be given that such events will occur in the disclosed time frames or at all. The forward-looking information and forward-looking statements included in this news release are made as of the date of this news release and the Company does not undertake an obligation to publicly update such forward-looking information or forward-looking information to reflect new information, subsequent events or otherwise unless required by applicable securities laws.